You have the necessary talent and your new camera and you are ready to start your new photography business. If that is the case, the next question you should think about is: How to make a photography website? Photography websites are photographers’ best friends; they are the easiest way to put the best work on display, to attract new clients, and to get in touch with them when your services are needed. While posting your photos on social media and attracting followers is also a good way to go, if you are an aspiring photographer wanting to take their career to a new level, a well-designed photography website is a must. So let’s dive deeper and take a look at some basic steps, tips, and tricks for creating the best photography websites. How to make a photography portfolio? Photography portfolio websites are great not to display your best work, but they also give you a chance to show your style so the potential clients get a better idea of who you are as an artist and what kind of business you’re running. Many people can make great photos, but you have to convince the clients that you are the kind of photographer they are looking for. 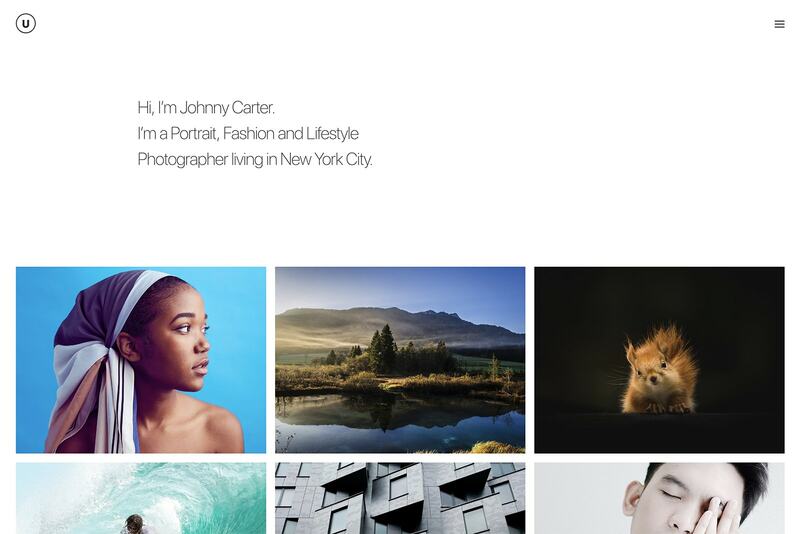 There are numerous photography website templates that will make it much easier for you to create a good photo portfolio and help the clients recognize your strengths. Why is Important to Have an Online Photography Portfolio? Websites for photographers are the best marketing tool photographers can have. It costs nothing but a bit of time and creativity to put together a free photography website and it can benefit you greatly. First of all, your photo website is often the first interaction you will have with your clients, which means it is also a perfect opportunity to make a great first impression. Photographer website helps you establish your brand, as well as put your best work on display and show off your strengths. In addition to that, if you want to make sure that you truly have one of the best photography websites out there, you can always consult or hire a photography website builder or use some of the popular photography templates. When designing photographers websites or simple photoblog sites, you should always set clear goals and objectives. You need to know who your clients are, what type of photography you are most comfortable doing, what are your styles, what you want the tone of your photo site to be etc. Only when you have clear goals in mind, you will know how to build a photography portfolio that really serves its purpose. Let’s say that you are a web developer but you also love photography and you would like it to become more than just a hobby. You are immediately in an advantage because you probably already know how to build a website for photographers. So if that is the case, making multiple objectives work shouldn’t be much of a problem for you. However, if you are not a web developer, consider sticking to 1 main goal rather than trying to do too many things at the same time when designing your free photo website. Doing a bit of investigation and finding the best website builder for photographers would also be a big plus. Social media is a great way to gain followers and communicate with potential clients. After all, everybody uses them so it would be a shame not to take advantage of that. Of course, some of your best photos won’t exactly look as impressive on Instagram as they would on your photography site but that doesn’t mean you shouldn’t use both. Create a photography website and then link your social media accounts there to get the most out of both. If you do a bit of research, you will notice that most top photography websites are linked to at least some of the popular social media or blogs. 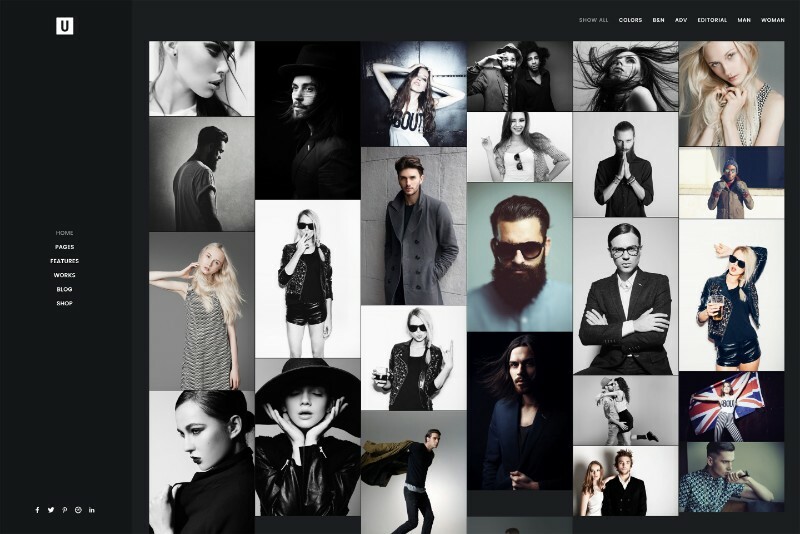 By now, it is probably clear to you that if you want to have one of the best photographer websites, you should start by creating a portfolio of your work. When creating a portfolio, you should always show off your best work and make it immediately noticeable to the potential client. However, don’t forget to spice it up with some diversity. Photographer websites can easily get boring if we keep seeing the same thing over and over again so don’t be afraid to mix it up and put on display the work that covers all the different styles and types of photographs that you are comfortable with making. Once you’ve selected the work you want to include in your free photography portfolio website, don’t forget to organize it in a way that will be logical and easy to navigate. Your potential clients will appreciate the level of professionalism that shows. Imagine spending all that time and energy on creating perfect photography websites and then having them buried on the Internet and impossible to find. SEO optimization is one of the key ingredients to creating a successful website – no matter the type of the site you are going for. Having great free photography websites for photographers is basically useless if it is impossible to find on search, isn’t it? So if you are doing it, make sure you’re doing it right and use a service that includes search engine-friendly URLs and enables you to take control of your SEO. When putting your photos on display, take into the consideration that the photo changes dramatically with the background and the surroundings. High contrast between the photo and the background usually makes the colors really pop up and appear more vivid. However, whichever color scheme you decide to go with, make sure it doesn’t clash with the photographs. When talking about photography website design, you have to be aware that it is crucial to use only the best photographs you have. After all, you are trying to show off your photography skills and the photos that the people see on your photography websites can make or break your business. For that reason, use high-resolution images only even if the users have to wait a second or two longer for all the images to appear on the screen. It will be worth the wait. So, we’ve talked about choosing the best images you have, organizing them into logical groups, making sure all of them are high resolutions etc. With all that in mind, you should also consider putting your images in a strategic order, meaning that the best ones appear at the beginning and the end of your display because those are the ones that will have the strongest impact on the user. Those images are the instant attention grabbers so if you bury your best work somewhere in the middle of the list, there is a chance it will go unnoticed. Instead, impress the users immediately with your best images in the beginning and then serve them another group of the best images at the end because those are the ones they will remember once they go through your whole portfolio. Designing photography websites is quite simple if you know how to do it right. Consider putting your portfolio together by yourself rather than hiring a professional because you know the best which photos you are the proudest of and which styles you are the most comfortable with – and then make them the memorable ones. Free websites for photographers have never been easier to create than today; just pick the right template, choose a service that enables you to take the control of your SEO, pick your best work, and organize it as best as you can. Don’t go overboard with the text and additional detail; instead make your photos pop up because, after all, they are supposed to be the real show stopper on your free photography portfolio website. 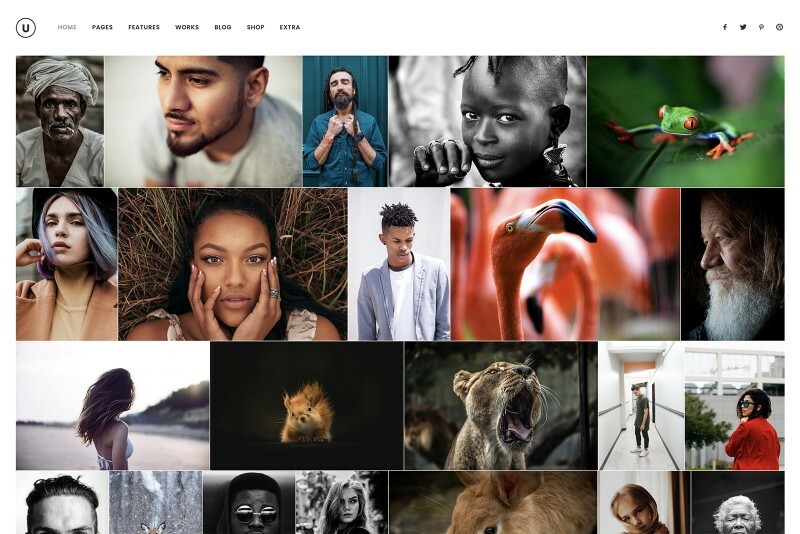 Uncode, the detail-oriented WordPress theme, brings the best of the beauty of photography websites to users with the help of its multiple customizable features, including single media options, isotope grid, and media carousels.